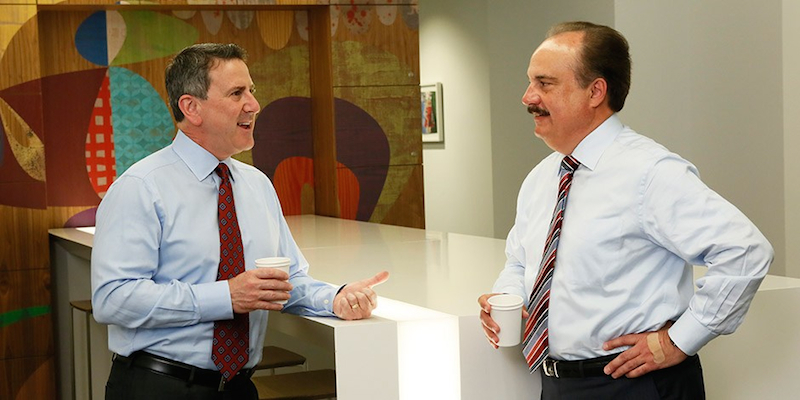 CVS Health’s Larry Merlo (right) with Target’s Brian Cornell when the companies announced CVS’ purchase of Target’s pharmacies in June. Larry Merlo, president and chief executive officer of CVS Health, was named the No. 1 CEO in the food/drug retailing sector by Institutional Investor magazine. Merlo was part of the financial publication’s “2016 All-America Executive Team,” in which more than 2,000 portfolio managers and analysts were asked to name the best CEOs, CFOs and investor relations professionals at the U.S. companies they cover. Coming after Merlo as best CEOs in food/drug retail were W. Rodney McMullen of Kroger Co. at No. 2 and Stefano Pessina of Walgreens Boots Alliance at No. 3. In its article on this year’s All-America Executive Team, Institutional Investor said CVS “dominates its category” and that Merlo “set the bar high for corporate innovation” last year when his company pulled tobacco products from all of its CVS/pharmacy drug stores. He was quoted as saying the move was”the right decision for our brand, our business and for the health of the country” and that it affirmed the company’s health care focus. The article also cited recent acquisitions by CVS, including its $12.7 billion purchase of Omnicare in August and its $1.9 billion deal in June to buy more than 1,600 Target pharmacies and 80 in-store clinics. (Target Corp. CEO Brian Cornell, by the way, was No. 2 among CEOs in the broadlines/hardlines retail sector in the survey.) Merlo told Institutional Investor that he expects the Target deal to gain regulatory approval by late this month. CVS Health also came out on top for food/drug retail chief financial officers, with its CFO David Denton finishing first in the Institutional Investor survey, followed by J. Michael Schlotman of Kroger at No. 2 and George Fairweather of Walgreens Boots Alliance at No. 3.